8 Health Benefits of Dill | Eat This! Dill has been used since ancient times. Today, it is used in salads, to make pickles, in soups, and other dishes. It’s a great way to add extra flavor to a dish without drastically increasing the calorie or fat content of a meal. Even though most people only use dill as a flavor enhancer in their dishes, there are actually many other reasons why dill should be eaten. Here are eight health benefits of dill. Dill is a plant based source of calcium and consuming healthy amounts of calcium is one of the best ways to strengthen bones and prevent bone loss. Osteoporosis has been linked with lower amounts of calcium consumption, so eating dill on a regular basis can prevent osteoporosis. Because dill contains anti-bacterial properties, it can be used to fight off infections internally and externally. Ancient cultures applied burnt dill seeds to wounds in order to prevent infections. Fruits and vegetables with bright colors contain properties that protect the body from free radicals. Dill is green in color, and it can activate processes in the body which seek out and eliminate free radicals. This free radical elimination is effective in preventing heart disease, cancer, and many other ailments. Dill contains properties which may improve digestive functioning. It may help to manage stomach acid levels which may help to reduce the occurrence of bad breath and acid reflux. It also soothes upset stomach, prevents diarrhea, and reduces the amount of gas produced in the intestines. 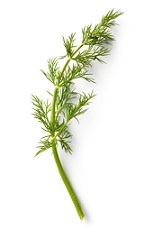 Additionally, dill contains dietary fiber which is beneficial for optimal digestive health. Dill is a traditional remedy for hiccups. It is said that mixing a spoonful of fresh dill into boiling water, straining the water, and then drinking the liquid will get rid of hiccups. Some people say that just drinking a few ounces of dill pickle juice will do the trick. Dill has been used as a headache remedy since ancient times. Use the same method for treating hiccups – place fresh dill into boiling water, strain it, and then drink the resulting tea to reduce the pain of a headache or drink dill pickle juice for a faster option. The essential oils in dill may have a calming effect on the body. It is sometimes used along with chamomile in order to promote calmness and relaxation. The calming effect of dill may also help fight insomnia. In fact, dill has been used since ancient times as a remedy for insomnia. Dill was consumed in water or the seeds were chewed for their calming effect. Some cultures placed dill leaves over the eyes to aid sleep.